Virtualization and cloud computing are among the biggest trends in recent years in the IT and telecommunications industry. Consolidation of IT processes or infrastructure simplification are the primary drivers of this trend. However, virtualization also opens up avenues for completely new strategies and business models in the Intercom segment such as centrally hosted instances in data centers, »Intercom as a Service« or multi mandante environments. The virtual »SIP Intercom Server Appliance« is our response to these market needs. The system includes all the features which are provided by the hardware systems and can cover nearly any power requirement. The capacity limit is set only by the underlying host hardware. Larger environments can be divided into multiple instances to achieve even greater efficiency within the infrastructure. 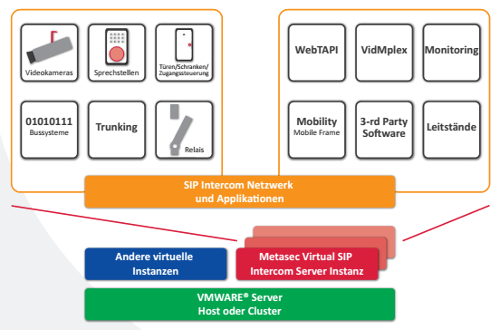 The SIP Intercom Server is available as a »ready to run« VMWare® Image or as deloyment template available. The software is fully pre-installed and up-to-date. You can start immediately with the establishment. For demonstration purposes, a VMWare Player Image can be downloaded – an incredible advantage in the sales process and customer performance. Relay contacts or the transfer to analog or ISDN interconnections can be solved via external hardware. If you are not satisfied by the opportunities offered by the virtualization environment availability, it can be extended with a further instance or a regular hardware system for a highly available redundant network such as GeoCluster.